"We present a real-time crowd model based on continuum dynamics. In our model, a dynamic potential field simultaneously integrates global navigation with moving obstacles such as other people, efficiently solving for the motion of large crowds without the need for explicit collision avoidance. Simulations created with our system run at interactive rates, demonstrate smooth flow under a variety of conditions, and naturally exhibit emergent phenomena that have been observed in real crowds." Just a quick post to say that the 3rd edition of Geospatial Analysis has been released on the Web and PDF version plus advance orders for 3rd edition printed version can now be made. 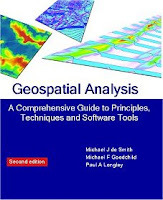 Within this 3rd edition there has been many updates including the Geocomputational methods and modelling chapter which contains a wealth of information on geosimulation. Click here to see the web version. "Written in an engaging and accessible manner, this book does a marvelous job of balancing its coverage on principles, techniques, and software tools for spatial analysis. ... It is truly a tour de force of geospatial analysis and is likely to become a classic ...I would highly recommend this book to anyone who is interested in learning about the latest developments in geospatial analysis and modeling." Prof D Z Sui, Review in: Annals, Association of American Geographers, April 2009 . The presentations from the Where 2.0 conference always blow me away. I just been looking at some, and three in particular caught my attention. The first was Jack Dangermond's "Realizing spatial intelligence on the GeoWeb" The idea behind the talk was that geographic knowledge created in GIS environments is increasingly being made available to Web 2.0 users. Other interesting talks with regard to building city models and understanding cities was Ludvig Emgård "World's Most Realistic 3D City Models?" and John Geraci's "DIY City: An Operating System for Cities." World's Most Realistic 3D City Models? Sanna Iltanen from the EDGE Laboratory for Architecture and Urban Research (Tampere University of Technology) and currently a visitor at our lab gave a talk the other day entitled "Experiments with SLEUTH-model" where she discussed the SLEUTH model, the input data needed to initialize the model, its calibration and explored some simmulation results from different land-use policies in the Helsinki and Turku city regions of Finland. More information about her talk can be found here. Always interested in ways to visualize models, I just seen Richard Milton's version of John Conway's Game of Life on a globe model. Richard has has written a short tutorial on how it was done (click here). The the Java applet allows you to explore how different configurations of automata evolve around the globe. To view the applet click here. Another similar model (shown below) was created by Ventrella to celebrate Earth Day. Click here to see more details about the model. After reading about land markets I come across this simple NetLogo model by Nigel Gilbert et al. The model explores how some of the main features of the English housing market emerges from the interactions between buyers, realtors and sellers (click here to run the model). There is a paper that accompanies the model (click here) which discusses the potential advantages of agent-based modeling over more traditional 'top down' techniques for exploring the housing market. While the model is not based on any particular geographical location or attempts to represent either the characteristics of individual housing units, nor spatial attributes such as proximity to services. It is still a very interesting paper investigating the complicated interactions that create a housing market in a simple model. Gilbert, N, Hawksworth, J C, and Sweeney, P (2008) 'An Agent-based Model of the UK Housing Market'. University of Surrey http://cress.soc.surrey.ac.uk/housingmarket/ukhm.html or click here to read the paper. SimCity is a city-building simulation game whose objective as the name suggests is to build and design a city. The original SimCity has now been released under the name Micropolis through a GPL license, therefore allowing people to experiment with the original model, maybe even adding more complex behaviors and rules? Adams (1998) highlights how SimCity provides a valuable teaching tool for urban geography, planners, designers and policy makers. The GUI of the game facilitate the learning about the complex, dynamic, and interrelated nature of urban problems. Adams, P.C. (1998), 'Teaching and Learning with SimCity 2000', Journal of Geography 97(2): 45-55.